Dive Journal: This is basically a fun dive that we call the “Boat Dive.” Feliza is busy taking care of an open water cert student named Peggy. Jason, Linda and I start out exploring the murky features again, I am again using my video camera. Linda quickly tires of the constant separations and lack of anything to see, and boards the boat within only a few minutes. Jason and I continue for a while, also continuing to get frequently separated, surfacing, and repeating. We finally agree to explore solo, since the water depth is so shallow anyway. 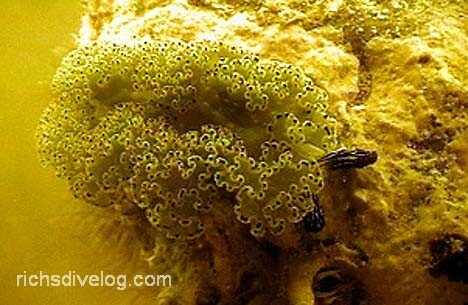 I take some interesting video of a sea slug and a combative Cortez damselfish. Jason took off and found an area with depths to 45 feet and evidently better visibility. Feliza was not thrilled that we had separated. Visibility on this dive is perhaps the worst yet, sometimes to only 1 foot.